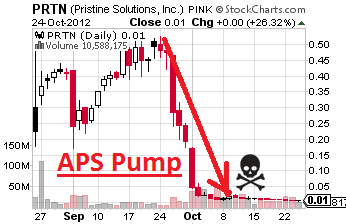 Awesome Penny Stocks (APS) has been hard at work pumping the stock of TagLikeMe Corp. (PINK:TAGG, TAGG message board) since Oct. 3, and in the last 3 sessions trading heated up. Yesterday TAGG closed up 19.24% at $0.2206 on 43.4 million shares. Undeniably, some people have made money on the pump play, and there is a possibility some more will. This, however, applies only to those who manage to get out before TAGG does what every other previous APS pump has done; namely crash and destroy the investments of the more naive traders. Distinguishing a pump play from a solid investment can be crucial. Pristine Solutions (PINK:PRTN) and Allezoe Medical Holdings, Inc. (OTC:ALZM) all fit the criteria. They were all touted by APS and they all crashed spectacularly. In its latest round of tout mails, APS is trying to convince people that TAGG is a company "that could become a giant in the future." It could, except it has about $1 million in liabilities and $16 thousand in current assets and hasn't reported any revenues whatsoever. The pumpers also revisit their wild conjecture of a buyout. At this moment TAGG has nothing significant to offer for any company to consider buying it. It hasn't generated a significant user base, it doesn't offer anything that other companies in this competitive sector don't already provide, and most importantly it hasn't shown any potential to monetize its operations. 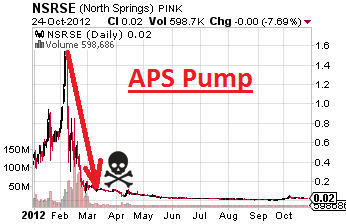 Most traders who have been dabbling in pumped stocks know how APS pumps work, but those who are new to the concept, should really do their due diligence before they decide what to do with TAGG. ^Those two comments are spam. Thanks for the article Mr. Gadzhev.